Come set sail aboard Michigan Crossroads Council’s sail training vessel Retriever! The Retriever, a 52′ ketch, is an offshore sail training vessel where youth will learn the fundamentals of sailboat handling, steering, waterway navigation, marine safety and various cruising techniques used by seasoned sailors! Based in its home port of Mackinaw City, Michigan, the Retriever will utilize harbors throughout the northern Great Lakes as classrooms to teach youth how to sail. Program options include two-night weekend cruises, and six (6) day – five (5) night programs. There are also extended holiday weekend programs on Memorial Day and Labor Day weekends! The Retriever is designed to accommodate a maximum of 10 youth and two (2) adults. Co-ed crews are welcome, but the advisor must contact the council in advance to discuss accommodation options. Programs are available for any BSA Troop, Team, Crew or Ship. Non-BSA groups must contact Michigan Crossroads Council for information about Great Lakes Sailing Adventure programs. Participants must be at least 13 years of age by September 1st of the year they participate for week-long Packages. Boy Scout Troops are limited to 10 eligible youth and two (2) adult male leaders. Co-ed Venture Crews or Sea Scout Ships must have co-ed adult leadership and may have a maximum of eight (8) youth members due to the sleeping accommodations on the vessel. All participants must be registered members of the Boy Scouts of America. During your sailing adventure, you’ll get to stop in any number of great ports. Grab some fudge on Mackinac Island, go hiking on Beaver Island, or camp for a night on the beaches of Petoskey- the possibilities are numerous! Please check the Leader Guide for the latest information. Whether on the lakes or the seas, David Rowe is truly a sailor for over 40 years. He is the Chairman of the Michigan Crossroads Council Sail Training Committee. He has led sail training programs for youth sailing in the Boy Scouts since 1979. A college sailing instructor in the British Virgin Islands, Rowe teaches sailing and live aboard fundamentals all over the country and world. David is a Coast Guard licensed Captain. He holds; a Great Lakes Masters 100 Ton License, an ocean going Operation of Uninspected Passenger Vessel Waters qualification, an Auxiliary Sail Endorsement, and Assistance Towing Endorsement. His committee of sailing enthusiasts is responsible for the operation and maintenance of the beautiful Alden 52’ ketch “Retriever”, providing offshore sailing and live aboard experiences to Scout units from throughout the U.S., cruising the northern Great Lakes. Dave is in his second season aboard the Retriever, and has had over 30 years’ experience sailing the Great Lakes. He received his training through the Delta College sailing school in 1986 and has spent most of his time sailing his own 25 Catalina and 36 Catalina. He is an attorney in private practice, in Saginaw, Michigan, specializing in environmental, real property development and municipal law, although his summers are normally focused on sailing the upper Great Lakes. In addition to his own boats, he has had experience in sailing other boats of equal or greater overall length, in the Great Lakes, British Virgin Islands and the Puget Sound areas. 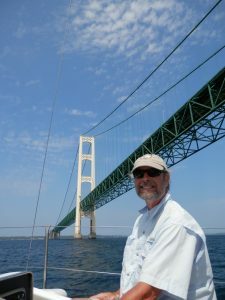 His main sailing experience, however, has been in the upper Great Lakes, and primarily Lakes Huron and Michigan. His experience in Lake Superior has been limited to the eastern shore. Since 1998, Dave’s Lake Huron experience has been primarily in the Straits of Mackinaw area, together with the entire North Channel, St. Mary’s River and Georgian Bay areas. He is well acquainted with all ports in the northern Lakes Huron and Michigan. As Dave nears retirement, he is looking forward to spending more time in sailing, and looks forward to sharing his experiences on the water with others, particularly youth. He has had the pleasure of teaching his own children the basics of sailing, which he believes has made him a better sailor. Dave holds a Master license, 50 Gross Registered Tons, for Steam, Motor or Auxiliary Sail Vessels, upon the Great Lakes and Inland Waters ,which was originally issued in 2007. Bob began his lifelong love of boating at age 9. 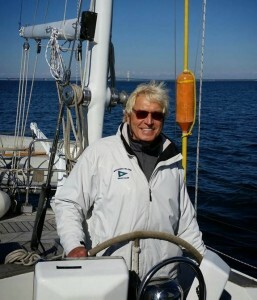 He has been actively involved in sailing instruction to youth and adults for almost half a century. He started sailing by working in a youth sailing program at a YMCA summer camp in Oscoda, Mi in 1968. 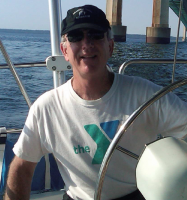 Captain Bob continued his passion of sailing instruction by being a Board Member of a youth sailing school on Lake Charlevoix in Northwest Michigan. For 18 years he owned and operated a charter sailboat company on the Northern Great Lakes. Captain Bob is comfortable on a variety of vessels. He has raced in 18 Mackinac races. In the Caribbean, he captained an 80 foot sailboat and an 80 foot performance catamaran. He was a wheels man on a Great Lakes Freighter. When he is not out on “Retriever” he captains a car ferry. Pawlus is a Coast Guard licensed Captain. For over 3 decades he has held a Great Lakes and Near Coastal (Ocean) 100 ton Masters License,with an auxiliary sail endorsement and commercial assistance towing endorsement. He has logged over 100,000 miles under sail, all over the world. Bob’s passion is teaching young adults how to sail. As he so aptly conveys it, “What better way than 6 days of total immersion in an offshore sailing adventure, on a vessel that has sailed halfway around the world. Captain Bob is in his 4th season aboard “Retriever”. He looks forward to the opportunity for you to be a part of The Great Lakes Sailing Adventure. Mike is one of the captains of the “Retriever-“a 52 foot ketch owned by The Michigan Cross Roads Council of the Boy Scouts of America. The Council operates The Great Lakes Sailing Adventure program whose mission is teach young people to sail and to develop stewardship of the Northern Great Lakes. School Principal—14 years; Guidance and Substance Abuse Counselor—22 years; Instructor in Higher Education—5years; Adjunct Community College Instructor –9 years. He is certified to be a school administrator, guidance counselor and teacher in several states. Community and Civic Service:Mike was a hospice volunteer for several years. For more than twenty years, he has been a mediator for the Community Dispute Resolution Program, which is sponsored by The Michigan State Supreme Court. Mike is a retired Bois Blanc Township Trustee.